If you have any questions or suggestions you are welcome to join our forum discussion about Trading Trend Line Bounces . The strategy we are about to share with you is based on trend following, which as we have said many times throughout our guides, is the most secure way to trade. This trading system does not require any other help tools, although using the Zig Zag indicator (Swing ZZ) does make it visually easier to identify the swing highs and swing lows that are required for the implementation of the strategy. Because this system is based on trend following, it will be ineffective and produce false signals when the market is trading sideways. Thus, we need to confirm that a strong trend is in motion, which is done by either using a moving average with large trackback period, 80 periods and more, or by determining the major trend on higher time frame (multiple time frame analysis). Specifically for this strategy we will use the latter and you can learn more about it in our article “Positioning Based on Analyzing Different Time Frames“. The idea behind this strategy is to be able to determine the major trend and the current trend well enough, so that you can make entries based on the minor trend’s swing highs or lows, but only in the direction of the larger trend. Because swing highs and lows act as key support and resistance levels, thus, they increase the chance for the price to bounce back off them, determining and positioning according to them is the essence of this trading system. So, let us begin with the specifics. We begin by determining the major trend. To reduce the effect of whipsaws, this strategy is best used at larger time frames, 30 minutes or higher. If we choose to trade on 30 minutes, we will need to switch to the hourly chart for a better grasp of the situation and then even on the 4-hour time frame to get a complete idea of the big picture. If you see that the market is not trending, but rather holding in a range, you should avoid entering any trade until a breakout occurs and a trend is formed. If a strong trend is present, you should draw trend lines on both higher time frames and then switch to the 30-minute chart. This will help you keep track of price development. This strategy basically relies on swing highs and lows in the current trend to determine your entry and exit points. Thus, in a bull trend for example, when the price drops to the trend line and rebounds from it, you must enter on a buy stop order or market order several pips (5-10) above the high of the bar, which rebounded from the trend line. Conversely, in a bear trend, you must enter short on a stop or market order 5-10 pips below the low of the bar, which touched the thttp://forums.binarytribune.com/forum/education/trading-strategies/45-fast-moving-average-crossoversrend line. In both cases (long and short), this can not only be the 30-minute trend line, but also the 1-hour and 4-hour ones, while they all act as significant resistance/support levels. As a profit target you should use the most recent swing high for a long position, or the most recent swing low for a short entry. As for the trade management, you have several scenarios at your disposal. You can exit the entire position upon reaching the profit target (the most recent swing high or low), or you can keep the whole position and move your stop-loss 5-10 pips below/above the newly formed swing high/low. You can also scale out and leave only a portion of the position and trail your stop to each new bar’s high/low as the trend continues to move in your direction. Check out the following example. On the example above you can see a very clear bear trend, which was also confirmed by the daily time frame (daily trend line running down as shown in the upper right hand corner). The market began forming lower highs, which upon connection resembled a bear trend. At bar (1) we should be fairly sure of the existence of the downtrend and we enter on a sell stop order several pips below the low of bar (1) (the white horizontal line). Our profit target is the previous swing low, as marked by the green line, while our stop-loss order is placed between 5 and 10 pips above the bar’s high. At bar (2) the market overshot the trend line only for the bear trend to accelerate later. Proof of bears’ determination to continue the bear trend is the huge double-shaved bear trend bar, which penetrated back the trend line and continued the trend. We again enter 5-10 pips below it and aim for a profit target at the previous swing low. At bar (3) the market undershot the trend line, but it was close enough to treat it as a short signal and we enter again 5 pips below its low. 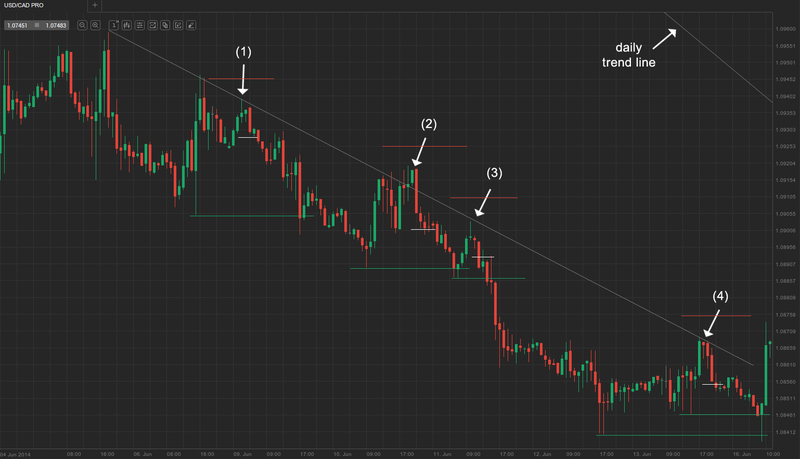 Our next entry is at bar (4), which reached two profit targets – the previous two swing lows.